Australia is allegedly spending $325 million on the commemoration of the First World War. This figure, we are told, is more than twice what the British have allocated, and 20 times the budget for events in New Zealand. That question was thrown into sharp relief last week when I travelled to Wellington to see how the Kiwis are handling the Anzac commemorations. I arrived the day after Tony Abbott and John Key had dedicated the new Australian Memorial in the Pukeahu National War Memorial Park. The memorial, designed by Australian architects, Tonkin Zulaikha Greer, in collaboration with artist, Janet Laurence, features 15 columns of rough red stone. The base alternates lines of red stone and grey New Zealand basalt. 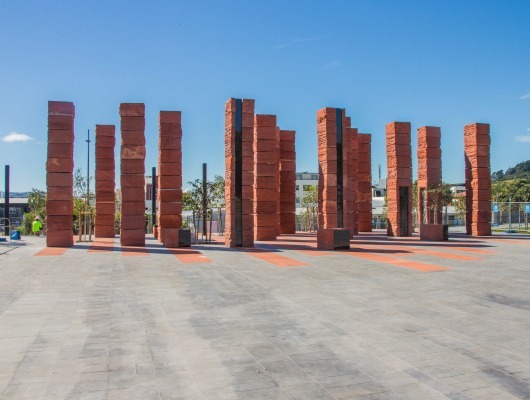 The Australian memorial is made from standstone columns, symbolic of the country’s red centre. The morning headlines informed us that the red stone came from a quarry near Agra in India. The excuse given by Chris Appleton, on behalf of the Australian Department of Veteran Affairs, was that it didn’t matter because Australia and India had both been part of Gondwanaland. This deserves some sort of award for desperation spin doctoring, especially as the architects’ website describes the work as “a landform of Australian red sandstone”. The Gondwanaland idea didn’t go down so well in vox populi interviews in which Wellingtonians suggested the monument should be pulled down. Indeed, it’s hard to avoid the suspicion that the Department decided it could save a dollar by using stone from India. The result is a memorial that will be forever flawed by this sleight of hand. 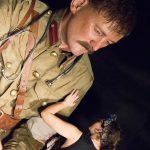 When it comes to World War One exhibitions, Wellington has two comprehensive displays that owe a huge debt to Sir Peter Jackson and his Weta Workshops. There are so many knights and dames in New Zealand it seems to confirm the country’s ongoing metamorphosis into Middle Earth, but in terms of their impact on New Zealand’s economy and culture there may be nobody more deserving of archaic honours than the men behind the Lord of the Rings film trilogy – Sir Peter Jackson and Sir Richard Taylor. It’s no more absurd than Sir Mick Jagger and Sir Elton John – let alone Sir Prince Philip. 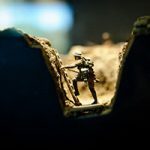 The Great War Exhibition at the Dominion Museum tells the story of the war through a mixture of dioramas, large-scale props, artefacts and historical photographs. The novelty is that most of the photos are colourised, which makes them look as if they were taken yesterday. It’s hard to decide whether this provides an unusual sense of immediacy or lifts these pictures out-of-time into the make-believe world of the cinema. I was fascinated by the images but didn’t find them as powerful as the stark black-and-whites of Frank Hurley and Hubert Wilkins shown in a constantly changing display at the Australian War Memorial, Canberra. 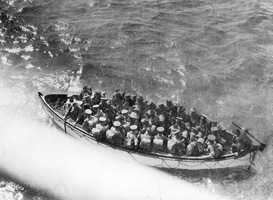 Australian soldiers land at Anzac Cove, 25 April 1915. Photographer unknown. The show starts in a rather shaky manner, as we enter via a typical Belgian town in 1914. This is the least convincing section, largely because it lacks the drama and war memorabilia of the later rooms. Soon we meet a lad named Will, whom we will shadow throughout the conflict. 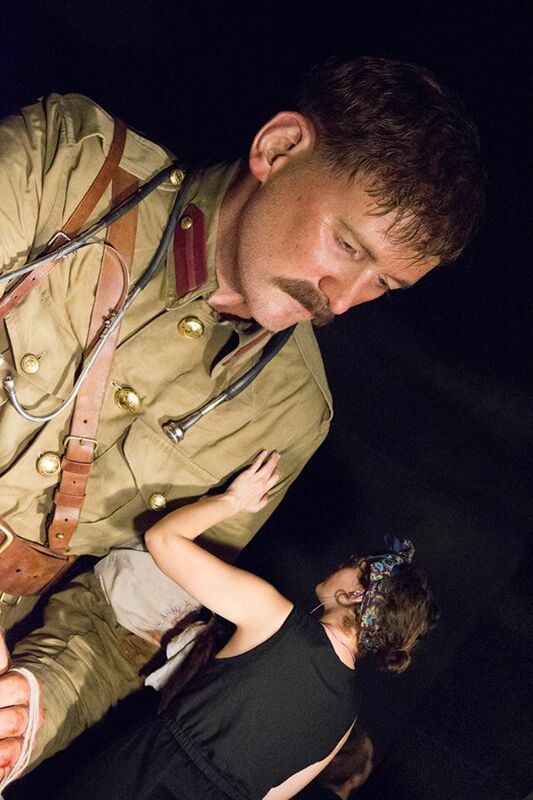 There is a room that alerts us to the role that horses played, and a hair-raising reconstruction of an early model tank, shown in the act of rolling over a German trench. There is even a London bus painted grey. One small, miraculous vitrine shows a lush Belgian landscape that transforms into a muddy wasteland, then back to its original state. The emphasis is on telling a story in the most memorable and vivid way. Along with the noise, the interactive, the full-scale weapons and vehicles, the reliance on old-fashioned dioramas is striking. It proves that these displays, when done professionally, still have the power to hold an audience in a way that audio-visual presentations cannot match. 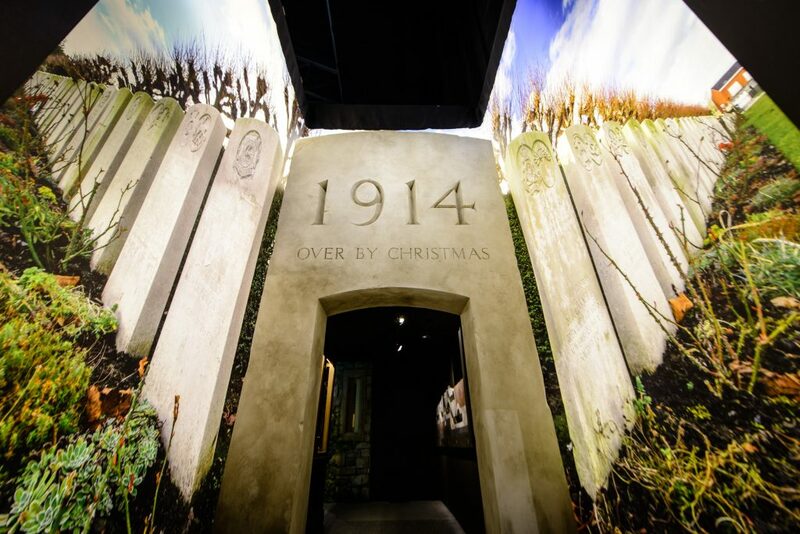 The Great War Exhibition will be running until Armistice Day, 2018. Wellington’s other major drawcard for the next three years is Gallipoli: The Scale of Our War, at Te Papa Tongarewa. This time the focus is on the Anzac campaign from a New Zealand perspective. 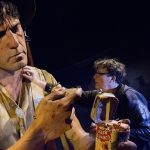 Once again, Jackson’s Weta Workshops have been involved, creating eight silicone figures, two-and-a-half times life size, based on actual participants in the campaign. In between there are story-boards, maps, diagrams and cases full of artefacts. 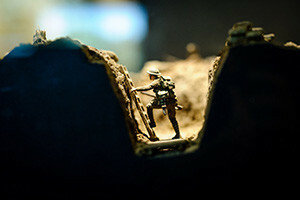 Still from The Great War Exhibition. One of the most innovative pieces is an interactive that shows an X-ray image of the body, and what happens when it is struck by bullets, shrapnel or a bomb blast. This is followed by records of a survivor and a fatality. The giant silicone figures are as perfect as any sculpture by Ron Mueck or Sam Jinks. Every hair, every tooth, every dirty fingernail has been reproduced. Every item of clothing and every weapon has been copied on a large-scale. Flies crawling on an opened tin of corned beef were created by 3D printing. This may sound like too much showbiz, but the larger-than-life figures have a tremendous sense of presence. We are conscious that these are sculptures of real people, not characters from a Tolkien novel. Combined with the historical material it adds up to the most powerful and engaging presentation of warfare I’ve ever seen in a museum. It’s obvious the organisers have undertaken a vast amount of historical research. It’s not only spectacular, it’s intelligent and it’s very moving. I wish I could say the same about Te Papa’s treatment of New Zealand’s national art collection, but it remains mostly in storage, aside from a small selection tucked away on the fifth floor. It seems as if the museum’s idea of art begins and ends with the Weta Workshops, although it shouldn’t be an either/or proposition. While Jackson and Taylor have helped put New Zealand on the map like never before, this shouldn’t mean the nation’s art heritage is ignored. The combined cost of the Dominion and Te Papa shows is approximately NZ$18 million, which looks like excellent value compared to the Australian efforts. What are we spending that $325 million on? Flying dignitaries to Turkey and France? A bonanza for “Events Management” businesses? It would be great to report that our art institutions have risen to the challenge of the centenary year, but the truth is painful to pronounce. There is nothing that comes close to the New Zealand efforts. The National Gallery of Victoria is holding a collection-based show called Follow the Flag, which I’ve yet to see. The Art Gallery of NSW has a collection-based show with the swashbuckling title, Mad Through the Darkness. Consisting of a mere 29 pieces crammed into a single room, the less said about this effort the better. By contrast, the NGV is showing more than 150 works, and has published a catalogue. This is a more thoughtful response to the centenary but it’s an anthology on the theme of ‘war’ rather than an engagement with the Anzacs or the battlefields of the Western Front. What makes the Wellington exhibitions so exceptional is the way they create a narrative for viewers with all levels of knowledge. 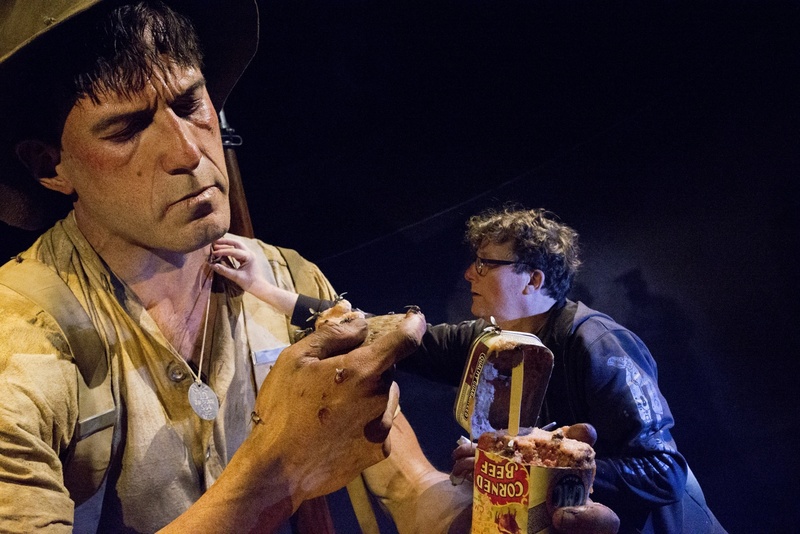 The New Zealanders have planned both shows carefully and taken pains over historical accuracy. There is little art content but considerable artistry in these unashamedly theatrical presentations. I thought of the famous dispute between Frank Hurley and C.E.W. Bean over how the war should be portrayed. Hurley looked for drama and spectacle, using photomurals and composites that Bean labelled “fakes”. The historian may have had similar qualms about the Wellington shows, which use every trick to bring the war alive. The difference is that Bean lived in a world in which memories of bloodshed were still vivid. Today it requires innovative thinking to break through the walls of dutiful respect to reconstruct the horror, tragedy and heroism of a cataclysm that saw a new world born from the ruins of the past.